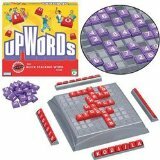 Once you've played Upwords you won't go back to Scrabble. The "Q" comes with the "U" on the same tile so you're not stuck looking for a "U".....and later you can put a letter over the "Q" and it opens up the board to go a totally different direction. There is a rule that you are not to stack more than 5 tiles high - we threw that rule out long ago. A lot of the fun is going over and over on a word base until they almost topple and your score can be about 40 ! It's a wonderful game for people who like words.